The BattleField Windows Media Skin is part of JosephsArt BattleField Suit. It was a simple but yet elegant look. The skin features AlbumArt, UserRating, A Playlist, Graphic Equalizer and a free form Video window. For right now the skin only includes one view, but I do hope to make a tittle bar version soon. The User Rating was fixed by Tim Hines, and all know bugs have been fixed. Hope that everyone enjoys this WMP10 skin. Permision has been obtained from JosephsArt to creat this skin. > The font; 'Basic5.ttf' is included and should be extracted to C:\WINDOWS\Fonts or to your Font Folder. > Jscript file by Tim Hines. 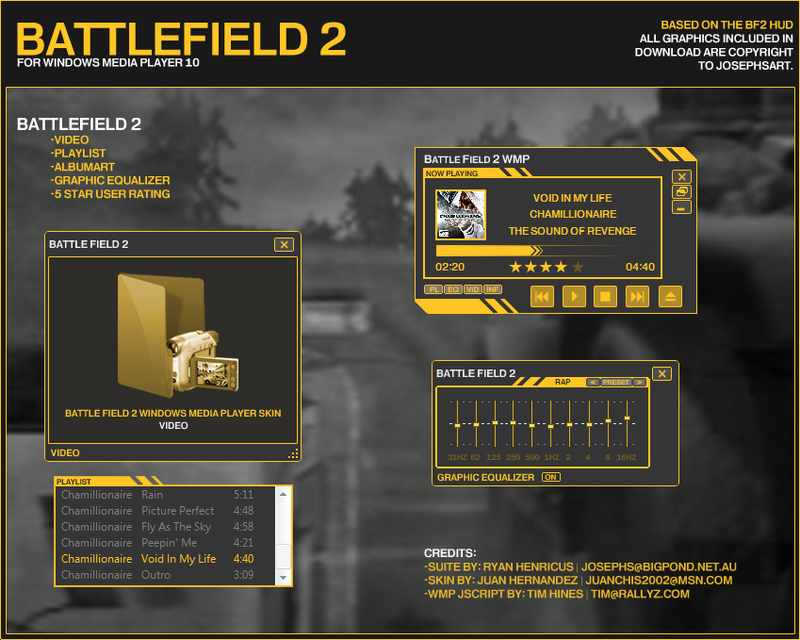 No image has been ported or stolen from EA Games or EA Games Battlefield 2. All images are copyright to JosephsART 2006. If you wish to modify this theme for your Own Personal Use, you may have permission. But no modification or porting is to be submitted, sold, shared, traded or compiled with other various goods without strict permission from the owner. You may Mail JosephsART with notes on what you wish to port, which graphics you have used to port and/or examples of your ported theme. This theme has been Designed for Windows Media Player 10. Thanks You and Have a Nice Day. Your welcome and if they are any more skins that you would like for me to work on, just hit me and let me know what u want. Hi .. I think u used my Handy Cam Icon in ur Video window .. Iz dat tru? or is it my mistake? Anywayz here da link to my Icon.. http://www.wincustomize.com/ViewSkin.aspx?SID=1&SkinID=593&LibID=39 .. plz do clarify Imidiately. if u've used my icon.. U shud've asked me b4 using it ... Thnx.